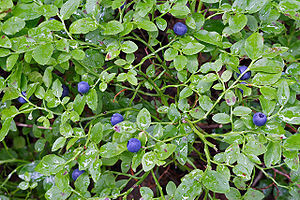 Did you know that blueberries only develop on new plant growth? That important piece of information totally escaped me until Friend told me that fact while I was working with him in the blueberry field he manages. He went on to tell me that he is going to investigate having the bushes heavily pruned during the coming winter, so that next years crop would be more plenteous. I stayed in the field after it closed to the public to pick a few berries for myself and I had a lot of time to contemplate what he said. Picking blueberries is a great way to have time to contemplate. Picking scarce blueberries is even greater. Dead wood needs to be pruned, but also any wood you want new growth on (ouch). Pruning has to harsh enough to stimulate new growth (ouch, ouch.) Pruning results not in just more fruit…but in an increased size in berries (ooooh!). Pruning is done while the bushes are dormant, in quiet times (aaaaah). Pruning lets sunlight penetrate throughout the bush (there is Sonlight in my soul today)…and pruning helps prevent the spread of disease and pests. Oh, the sweet joys of finding His handwriting in a blueberry bush. Christina C. is a woman energized by encouraging others. She never wants to forget that she is a ragamuffin...a broken earthen vessel, heavy laden, bedraggled, and weary until grace changed her life. She now holds a treasure in a cracked earthen vessel. Anything bright or beautiful is the treasure shining through the cracks. This entry was posted in CC Posts and tagged Blueberry, Christianity, faith, God, harvest, Jesus, Plant, Pruning, Pruning shears. Bookmark the permalink. Another great example of our Lord being glorified in nature…. Lord bless you! …the whole earth is full of His glory!! Your comment brings to mind Elizabeth Barrett Browning’s poetry…”Earth’s crammed with heaven, And every common bush afire with God; But only he who sees, takes off his shoes”…thank you for the thought.